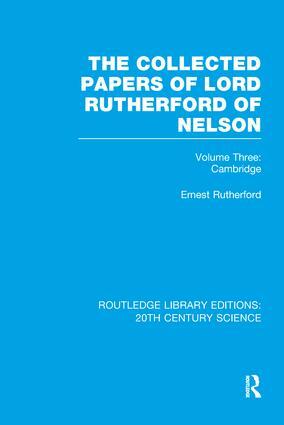 This is the third of three volumes which together contain the complete range of Lord Rutherford’s scientific papers, incorporating in addition addresses, general lectures, letters to editors, accounts of his scientific work and personal recollections by friends and colleagues. The final volume, first published in 1965, covers his period as Cavendish Professor from 1919 to 1937. Following on the immense fertility of his years in Manchester – only overshadowed towards the end by the war – we now turn to his last years as a world figure at the Cavendish Laboratory, where he continued his work on the properties of the α particle and the nature of the atom. In each volume can be found photographs of Rutherford and his collaborators, multiple graphs, tables, diagrams and charts, and also pictures of the original apparatus which is of historic interest. Reissuing works originally published between 1921 and 1988, this set offers a selection of scholarship covering historical developments in scientific thinking. Volumes range from Einstein's theories to quantum theory and genetics making this a comprehensive collection of previously out-of-print works. Many of the works review scientific advances in general or science and philosophy at the time; a great insight into the intellectual world of the 20th Century.